We’ve seen an explosion in the number of smart home products currently available. Some are standalone units. Others have speakers and/or touch screens. The iHome iGV1 falls somewhere in the middle. It’s a smart speaker with Google Assistant and a digital clock built-in. It’s great if you want to replace your beside clock with something a bit more powerful. 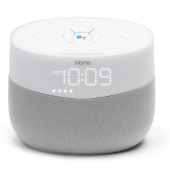 The iGV1 is an innovative bedside clock with the Google Assistant built-in so you can play music, audio books, and more. Control smart home devices, get weather, news, traffic and more. Talk to your Google Assistant from anywhere in the room. Play audio wirelessly from Bluetooth devices. Streams thousands of music stations via Wi-Fi audio. Operates on included 100V-240V universal AC adapter. 1 Amp USB port to charge mobile devices (cable not included). The device itself is rather unusual in appearance. I’m not sure if it has a retro look or simply a “different” look but it certainly doesn’t look like any other clock or smart device I’ve seen. The shape is neither square nor round. The colors are neither unassuming nor attention grabbing. The mesh cloth on the lower two-thirds of the device protect the speaker but give it a bit of a rugged look while the soft frost white plastic on the upper third stands in stark visual contrast. The iHome name is splashed along the top. It isn’t huge but it certainly noticeable and makes it clear that the company sees this as a branding opportunity as much as a device sale. The most retro (one can also read bad) aspect of the device, from a visual perspective, is the implementation of the alarm clock. The company went back to the tradition of using a series of LCD dots to create the numbers. They certainly are easy to see, but they look like something from the 1970s. Seriously, the clock itself looks like the first generation after we finally got rid of those alarm clocks that had the numbers that physically flipped down to reveal the next number in line. The fact that the clock shows the upcoming alarm is a nice touch, and I do give the company credit for including the ability to dim the brightness of the LCDs. You can have it pumped all the way up and shining brightly or lower it down to a relatively soft glow. That noted, however, that glow is still a bit much for someone who loves a pitch black room like Raina. She’ll probably be using this device going forward, but it’s going to take her some time to adjust to it. At the back of the device, there are two ports. One is there to accept the included wall adapter and cable so that the clock can receive power. The other is a USB port into which one can connect and charge a separate device. The company didn’t include a cable with the clock, but it’s a standard USB a port so pretty much any cable you have received over the last few years that isn’t specifically USB-C should work. The addition of a USB charging port is rather smart since it means you can plug your phone into the clock at night to charge without the need for an additional wall adapter and cable set up. I would’ve preferred it to include an additional USB port or a 3.5 mm auxiliary jack, but they aren’t present. As far as the lack of a 3.5 mm auxiliary jack goes, one can’t completely fault the company since they did include Bluetooth connectivity. That means that, while you can’t plug your device directly into the clock and use its speaker, you can pair a phone, tablet or laptop to the speaker and run your audio from the source device into the clock thereby taking advantage of the speaker built into it. 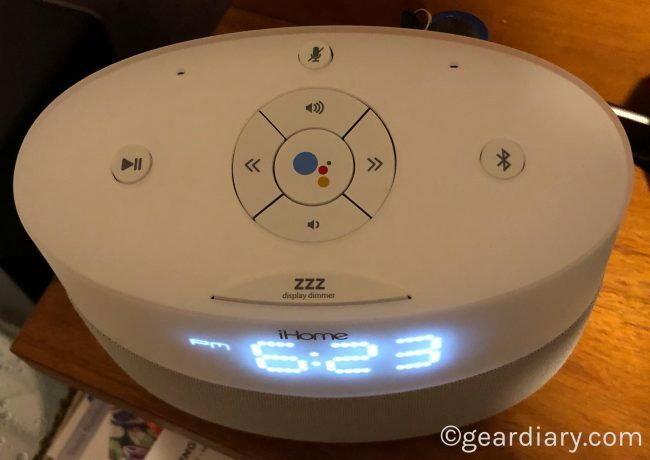 The smart clock is designed to be used by voice, but the company also realized that, since this is likely to be used next to a bed, there are times when speaking out loud isn’t ideal. That’s especially the case if you share the bed with someone and they tend to sleep later than you. That’s why the company also built a nice variety of physical controls into the top of the speaker. There is a button for play/pause. There are buttons to advance or repeat tracks. There are volume up and down buttons, and there is a dedicated button that triggers the Google Voice Assistant. Finally, there is a button that can dim, or shut off, the clock LEDs. Even at the dimmest setting, I’m finding the need to shut the display off at night. It is simply too bright for those of us who like a truly dark room. The sound it outputs is good but not great. I would describe it as being what one might expect from a bedside clock of this size. No, you’re not going to want to use this as your main audio device in the living room or even in the bedroom, but if you want to enjoy a little bit of music or wake up to the tune that is on your phone or tablet it certainly will get the job done. 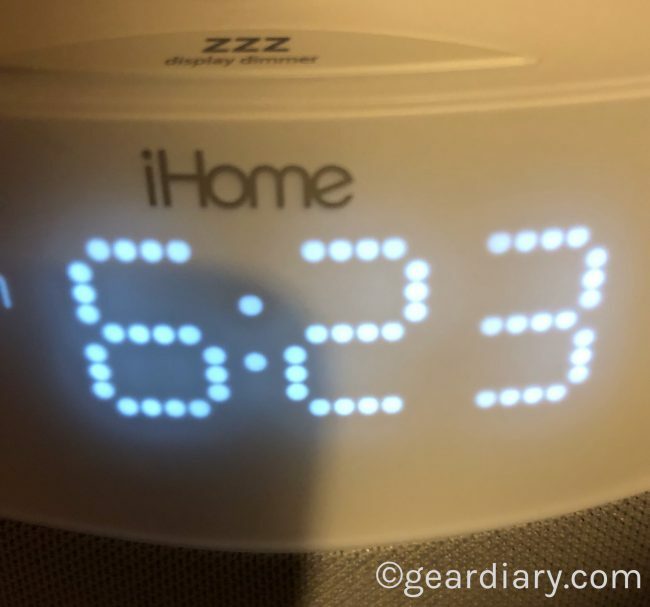 Based on the features thus-far described, the iGV1 is a decent alarm clock speaker. The display is easy to read, the upcoming alarm is indicated just below the time and the Bluetooth speaker is good enough for some late night music or, if you prefer, waking to music. That would be worth a few dollars, but certainly not the $139 iHome is charging. The thing is, this isn’t just an alarm clock. 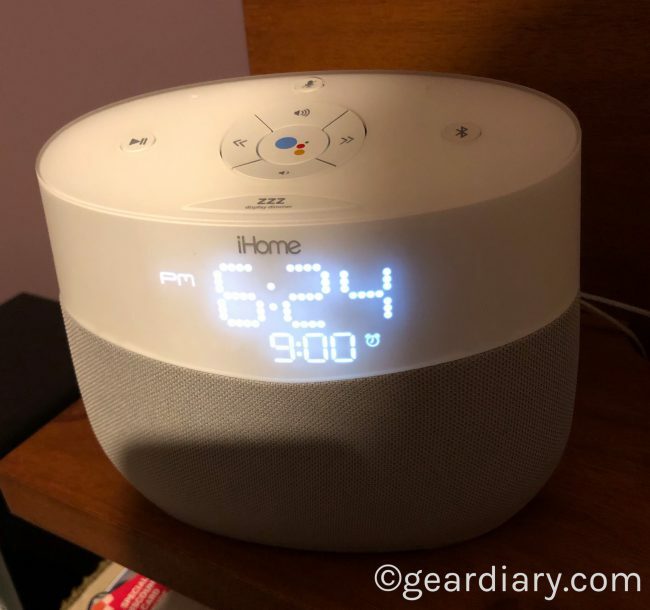 By adding Google Assistant to the iGV1, iHome turned this bedside clock into something far more powerful than hat likely sits by your bed right now. 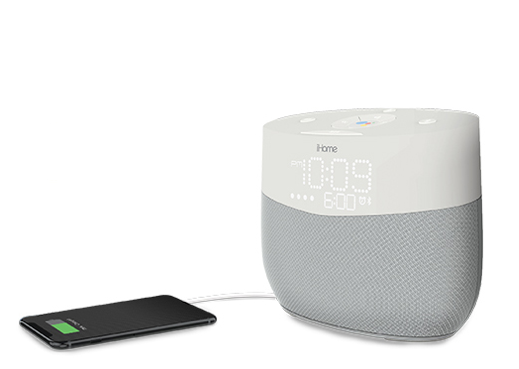 This iHome smart speaker comes with the Google Assistant built-in. Ask it questions. Tell it to do things. It’s your own personal Google, always ready to help. Play music, manage tasks, control your smart home devices and more, all with just your voice. Small holes at the top of the clock hide the Far Field microphones. They do a good job of picking up your voice and let you control Google Assistant handsfree. Once set up, Google Assistant can be used to play music, audiobooks and more. 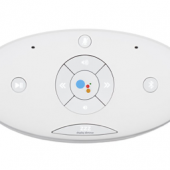 The Far Field Voice Activation for Google commands is sensitive enough to respond from pretty much anywhere in the room. It can be used to control your smart home devices, check the weather, as for a news update, get traffic, etc. The list goes on and on and, if recent trends continue, Google Assistant will get better over time. All you need to do to access Google Assistant is say, “Hey Google.’ This triggers the Assistant which then waits for your next command or question. Google Assistant: Google Assistant built-in with Far Field voice capability. Play music, audio books, and more. Control smart home devices, get weather, news, traffic and more! Just say “Hey Google…” to get started. As you likely know, Google Assistant integrates deeply with your Google services which means that the clock itself is an interface between all of your data and the clock. The accuracy of the voice control is surprisingly good and means you can not only use the device seamlessly but access your data accurately. I’m a huge fan of Amazon’s Alexa voice services and have Echo devices throughout my house. Still, as I’ve begun exploring Google Assistant, I’ve been increasingly impressed. It is fast, responsive and, since I use Google services for my email and calendar, ties directly into my key productivity services. The iGV1 is a decent device that does what it promises. 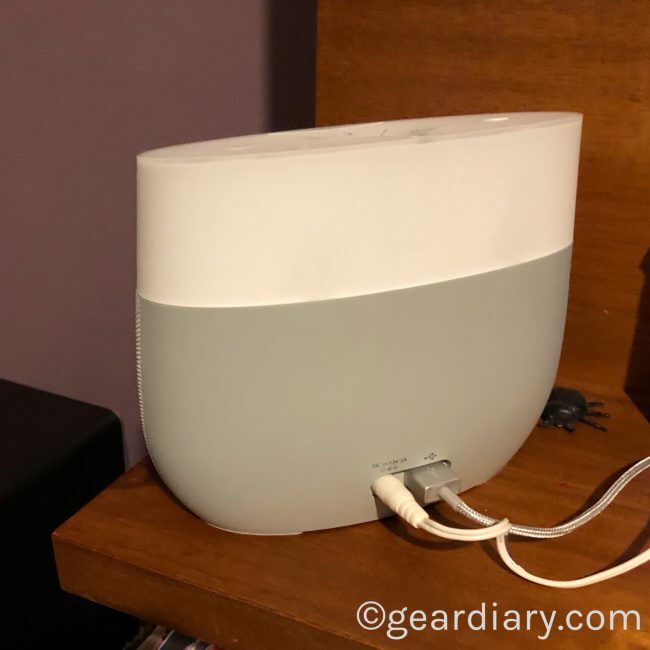 Having Google Assistant built into this bedside or tabletop clock means that you can do an abundance of different things without ever having to touch the device itself. As noted, you can speak to the device and turn up the thermostat, play some music, turn off my lights, set a timer for fifteen minutes, add butter to my shopping list or find out how long will it take to get to work. The possibilities are endless. It’s a smart bedside clock that will transform the way you interface with something that goes largely unnoticed next to your bed. But then there is the price. At $139.99 this device is certainly not the most expensive smart device on the market. At the same time, it is competing with things like the Google Home Hub. That device is normally $150 but over the current weekend has dropped to just $99 and we expect to see that price during future sales too. At $99 it makes sense to purchase Google’s device over this one. At its full price, however, the difference between $139.99 and $150 isn’t significant enough to make one a clear buy over the other. If you like the look of iHome’s offering, this is worth picking up. If you don’t like the unusual appearance of this accessory or you want a touchscreen, however, you might want to check out what Google is offering or even the current offering from Lenovo or JBL. 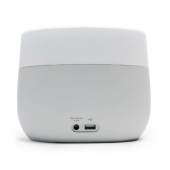 In every case, however, you get access to Google Assistant so it is all about getting the device that fits your need and decor. 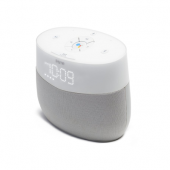 The iGV1 is a nice bedside alarm clock with a speaker, Bluetooth connectivity and Google Assistant built-in. It does an excellent job of recognizing my voice and is quick to respond. 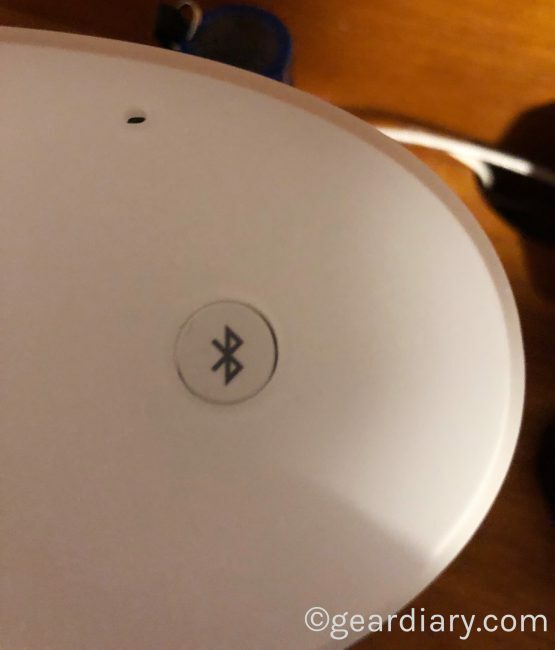 I love being able to set alarms using my voice, and I appreciate the fact that, once the device is connected to your Wi-Fi network, it accesses the time via the cloud, so the clock is always accurate. At the same time, I have some questions about its appearance, about whether or not it needed to be as large as it is, and its lack of a screen. As an increasing number of smart devices include screens of various sizes, having a series of LEDs that show you the time while not having a screen feels a bit limited and old-school. Then again, if you’re in the market for new bedside alarm clock and you can afford to spend a little bit more than you would for a basic clock, you certainly should consider buying this. So while I mixed on it, I’m also happy to have it at home and know that will be using it going forward. The iHome iGV1 is a good device… but not the home run I hoped it might be.